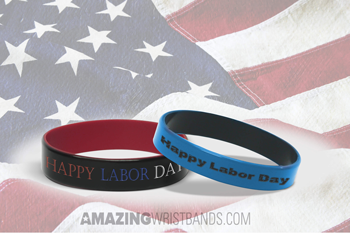 Celebrate Pride for Working with Labor Day Wristbands! With Labor Day coming up, there isn’t a better time to buy these wristbands. On the first Monday of September, the American labor movement is recognized. Things like the economic achievements and breakthroughs are celebrated through this annual tribute. The first Labor Day holiday was celebrated on Tuesday, September 5, 1882, in New York City. Since then, it has become a nationwide holiday for America. Although changes in the character of Labor Day have been through changes, it is still prominent due to the fact that it celebrates what makes America and the American Dream. Celebrate the day itself! After all, that’s why it’s a holiday. Give it to a worker of your choice. They will be satisfied that you recognize what they have accomplished through all their hard work. Give them as gifts as a parade—add to the Labor Day celebration! Remind everyone that it is Labor Day. With the business that goes on in everyone’s life, it may sometimes slip their minds. Customizable text—add a specialized message! Add different colors or color combos to help your wristbands stand out. Different sizes, such as one-inch wristbands and quarter-inch wristbands. Add USB images and clipart to your wristbands. Why Buy Labor Day Wristbands from Amazing Wristbands? Amazing Wristbands is a leading provider of customized silicone wristbands available online, including Labor Day bracelets. Our wristbands are comfortable, durable, and non-allergenic, made of 100% silicone. Many of our wristbands can be created with our easy-to-use online builder to create your personalized wristbands. Or, call us and our professional and friendly customer service agents will help you. In addition to standard wristbands, AmazingWristbands.com also offers super popular slap bands that “snap” to a person’s wrist, as well as half-inch bands, thicker one-inch bands, adjustable bands, USB bands, silicone rings and silicone key chains. Get a detailed quote for your Labor Day wristbands in minutes!